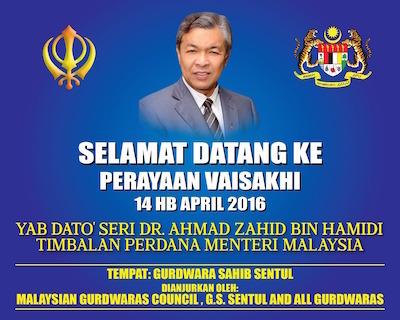 Malaysian Deputy Prime Minister Ahmad Zahid Hamidi is scheduled to attend a Vaisakhi function at Gurdwara Sahib Sentul in Kuala Lumpur, tomorrow. The event, co-organised by the Malaysian Gurdwaras Council (MGC), is one of a string of events in Malaysia to celebrate the establishment of the Khalsa in 1699. 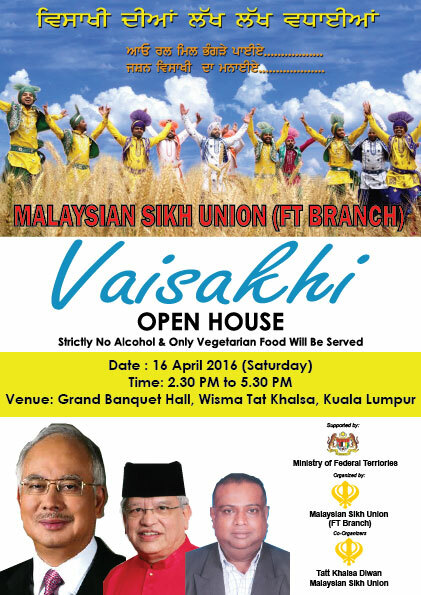 On 23 April, Malaysian Prime Minister is scheduled to attend a national level Vaisakhi supported by the Ministry of Tourism and Culture in Kuala Lumpur. 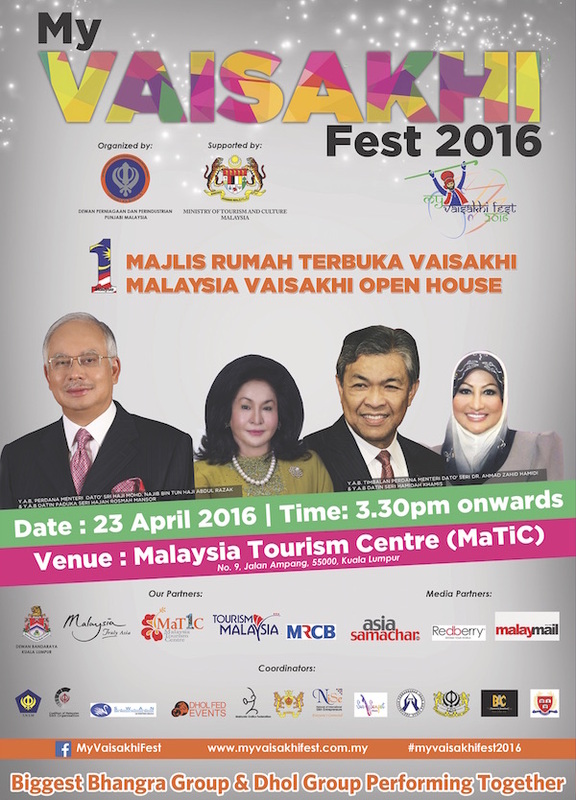 Mohd Najib Razak will be speaking at the event, called MyVaisakhi Fest 2016, organised by the Malaysian Punjabi Chambers of Commerce and Industries led by Dalit Singh Dhaliwal. DPM Ahmad Zahid and Tourism and Culture Minister Mohamed Nazri Abdul Aziz are also scheduled to be present. At the same event last year, Nazri said the Vaisakhi Festival would be listed in Malaysia’s tourism calendar to promote the rich culture and heritage diversity to put Malaysia on the map as a must visit destination. Daljit, a director at the Malaysian Tourism Promotion Board and is the Indian affairs advisor to Minister of Tourism and Culture, served a two-term senatorship between 2008 and 2011. In Puchong, Selangor, Malaysia’s Health Minister Dr S Subramaniam will be attending a Vaisakhi function today (13 April) at 7.30pm. See here. On 16 April, Federal Territories Minister Tengku Adnan Mansur will attend a Vaiskahi function at Tatt Khalsa Diwan in Kuala Lumpur between 2.30pm to 5.30pm. The event is organised by the Malaysian Sikh Union (FT Branch). In Penang, Penang Chief Minister Lim Guan Eng will officiate a state level Vaisakhi festival from 6pm to 11pm on 23 April.